Lord, these people refuse to acknowledge the fact that the North won. While the Dixie battle cross, first added to Georgia's flag in 1956 by an all-white Legislature resisting integration, was removed from the state flag in 2003, it has continued to fly at the Dodge County courthouse in Eastman as part of a memorial to Confederate war dead. Eastman is located roughly 50 miles southeast of Macon. The local NAACP claims the flag was to fly only once a year. It has remained despite complaints from the civil rights group, which is prepared to mount a legal challenge to have the flag taken down. "It's a symbol of racism and hatred," said John Battle, president of the Dodge County NAACP. After trying for years to resolve the matter and getting nowhere, the NAACP retained an attorney who sent a letter last week to the board of commissioners asking them to stand by the original resolution, passed in 2002, allowing the annual display. On Monday, the board met in a closed session and decided, in a vote taken at their public meeting afterward, to keep the flag up 365 days a year. Commissioner William Howell, Jr., who cast one of three votes in favor of displaying the flag, said the commission's hands were tied. "We're probably going to be involved in a lawsuit either way," Howell told the Atlanta Journal-Constitution. "The Sons of Confederate Veterans is going to sue us if we take it down and the NAACP will sue us if we leave it up." Howell cited a state law that he said prohibits the commissioners from removing appropriate items from publicly owned memorials. "It's as much a part of our history as Martin Luther King," said Howell, adding there's been little objection from the residents of Dodge County, about 30 percent of whom are black, according to U.S. census figures. "You've got two or three people raising a ruckus." Only one of the board's four commissioners voted to remove the Stars and Bars from courthouse grounds. Battle said it's not just African-Americans who oppose its display. "When people come into town, what are they going to think?" he said. "They're going to think these people down here are still racists. It's another black eye for Dodge County." The fact that the commissioner compared the Confederate flag to MLK says all you need to know about these people's mindset. Look, I'm a proud Georgian and trust me things like this don't surprise me at all. But let's be clear, I've seen just as many confederate flags here in Western Pennsylvania as I've ever seen back at home. Yankees have just as much fascination with the Antebellum South as some southerners. Don't let that northern accents fool you. We have heard the arguments presented by Mr Battle previously - Bad for econmy, bad for business, bad for public relations et al ad naseum. Ex Gov Roy Barnes used the same excuses for changing the old 1956 State Flag. He was sadly mistaken and even lied to accomplish his ends. After Barnes changed the flag, the economy fell thru the floor. Georgia Student SAT scores dropped from 49th to 50th in the USA. Numerous businesses closed down or moved away to other states/countries. Barnes told us that Mercedes Benz would not locate in Georgia if the flag wasn't changed. It was changed but the Benz plant located in South Carolina (where they fly a flag similar to Dodge County) and even Mercedes Benz officials admitted the flag was not a reason they had considered in choosing a plant location. Finally, when the public was allowed to vote on the state flag in 2004, the Barnes flag only received 212,200 votes out of a possible 4,000,000 - so Barnes only changed the flag to appease 212,200 people in a state of 8 million citizens! 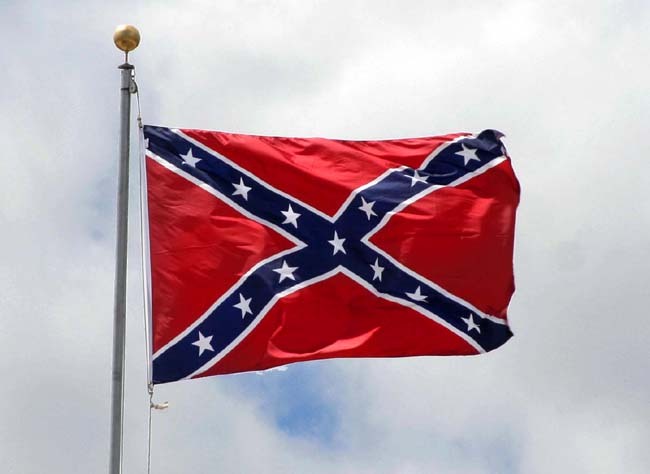 Over in South Carolina, we were told that if the flag was not removed the NAACP would boycott the entire state. It was removed, but the boycott began anyway. Since that time ironically tourism has risen and crime actually has been reduced slightly. We should all wish for a NAACP boycott! The square Battleflag on the old 1956 flag of Georgia, and the one used by SC and Dodge County was never used by any hate group - ever. It was a soldiers flag, and soldiers is what it is being used to honor! Why does nobody complain about the State Flag of New York? The flag has a picture of a masted ship that represents 'Commerce" The seal was designed in the late 1700s. During the 1700's the most popular and lucrative commerce in New York was the importation of slaves! Thanks, God Bless, and Happy Easter!